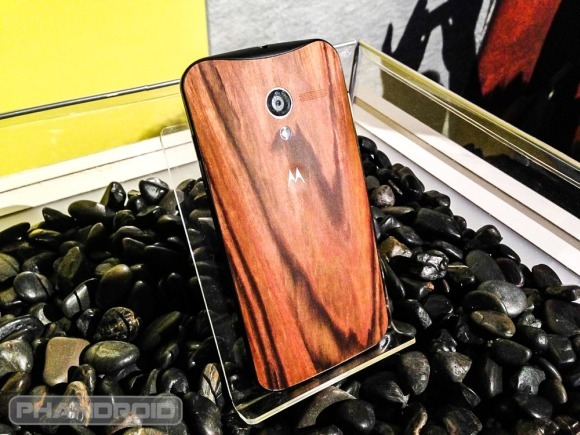 Moto X: a full-force comeback, or a final nail in Motorola’s coffin ? After a long break from the Android smartphone game, Motorola has recently announced its first flagship smartphone of 2013, and the first flagship released under Google’s supervision. 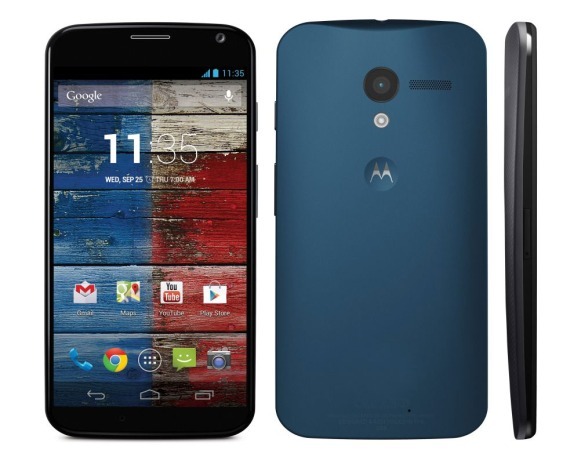 The smartphone in question is the Motorola Moto X, and this article will try analyze the specs and features of the Moto X and come up with an answer to the following question: is the Moto X the sign of a full-force comeback, or is it a final nail in Motorola’s coffin as a smartphone manufacturer. As the Moto X was intensely rumored and leaked during the past couple of months, there was little surprise for us in store when Motorola actually unveiled the Moto X back in the first day of August. But only now, with all the pieces (hardware, software, pricing and availability) can we make a proper assessment of what is it that the Motorola Moto X brings new to the already crowded high end table. Probably the most impressive aspect of the Motorola Moto X (and definitely one that Motorola’s marketing team will focus on in the following weeks) is that customers can custom-design their device on the Motorola Moto Maker website. Customers can choose from 18 back plate colors and 7 various accents, and they can even engrave a text on the back, or select the wallpaper and Google ID before the phone ships. And if this is not enough the intrigue smartphone users who feel that modern-day smartphones are just a little too boring, Motorola is testing a wooden case for the Moto X, one that will hopefully be released by the end of September. This would grant the Moto X the title of the “first wooden smartphone ever“, and will surely turn a lot of eyes in its direction. Although the Moto X will be released with all four major US carriers (Verizon, AT&T, Sprint and T-Mobile), at launch time, only AT&T customers will be able to custom-design their smartphone via Motorola’s Moto Maker website. If the tech media was impressed with the color customizations options, not the same can be said about the Motorola X8 mobile computing system that lies at the heart of the smartphone. The X8 is nothing more than a combination of a Snapdragon S4 Pro (dual-core version) SoC, a chip for contextual computing, and one for natural language processing. The Snapdragon S4 Pro inside the Moto X consists out of a 1.7 GHz dual-core Krait CPU, an Adreno 320 GPU and 2 GB of RAM. And these components are all standard, with no extra modifications being made to the hardware. Motorola officials claim that they’ve opted for a dual-core processor since only few Android apps use the extra cores and that they have preferred a longer battery life instead of unnecessary performance. The Google-owned company also claims that they’ve optimized the software to run as smoothly as possible on this specific SoC while maximizing battery life. Early reviewers claim that the 2,200 mAh battery lasts significantly longer than that of other high-end Android smartphones such as the Galaxy S4 and the HTC One. One specific software tweak (Active Notifications) is likely to help a lot in this aspect, but we’ll talk more about that a bit later in the article. While this streamlined experience may be of great value for some, Android smartphone users are notoriously and permanently craving for the best and fastest specs out there, and the Motorola Moto X just isn’t on par with the Samsung Galaxy S4 or the HTC One when it comes to raw processing power. While personally I’m a firm believer that extra processing power is useless unless put to good use, there is a chance that a significant proportion of the tech-savvy Android fan base will look down on the Motorola Moto X for its less-than-high-end specs. Active Notifications allows users to instantly check their notifications once they have missed a call or have received an email. Only the middle of the display will be turned on, and users can click anywhere on the display to go right to their notifications. 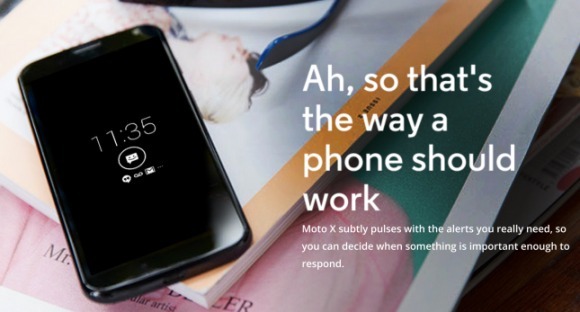 Since the Moto X uses an AMOLED display (only the portion of the display that is turned on uses battery), this feature is likely to help a lot with the battery life as Motorola claim that the average users turns on his smartphone 60 times a day to view notifications. An “always-on microphone” functionality that allows you to query Google now after using the “OK, Google Now” pass-phrase. The camera can be instantly accessed by twisting your wrist twice with the device in your hand. Although Active Notifications is quite an useful function, I fear that it may not be enough for the Motorola Moto X to stand up against other Android smartphone with better and more advanced functions (HTC’s BlinkFeed and the Air View function on the Galaxy S4 are just two of many examples). Up to this point, we have a very good idea on how the Moto X stacks up against other high-end smartphones, and the general consensus is that spec-wise, this is not the best smartphone of 2013. In this context, many were disappointed to learn that the Moto X will come with a price tag of $199 on a two year contract. SIM-free, the 16GB version of the Moto X is rumored to cost north of $500, and that’s right up there with the HTC One, the Galaxy S4 and the Apple iPhone 5. As far as numerous critics are concerned, this is worst part about the Moto X. To answer the question that titles this article, let’s sum up the advantages and disadvantages of the Moto X. Only Android customers will be able to answer to this question, and they will do so by purchasing the Moto X or choosing another high-end smartphone.We should also bear in mind that Motorola is rumored to spend a whopping $500 million on its Motorola Moto X marketing campaign, and this will surely help with shipment numbers. Subjectively, though, I find that the Moto X is a great example on how Android smartphones should be designed: with efficiency and personal customizations in mind. However, I’m not sure that a better battery life and a custom engraving on the back are enough to justify such a high price tag, especially considering that many other smartphones offer much better specs at that price point. Mihai Andrici has written 7 post in this blog. Hi, I'm Android Blogger and I enjoy writing about Gadgets,Latest Technology,Smart Phones. Sony Rolled Out Xperia Ion With Great Features.